When two people work on the same projects at the same time, there are bound to be situations where two people have edited the same code in two different ways. In an ideal world each member of your team would work on their own stories and discuss potential conflicts before they arise. But in the real world conflicts like this happen all the time. The key to handling merge conflicts is to catch them early and often. It’s easier to resolve one or two merge conflicts per day than to handle 10 or 20 merge conflicts at the end of the week, after you and your teammates have forgetten the specifics of your code logic. I’m going to show you how to do mitigate issues using git rebase. Pretend that you’re working on a team project and you have a story assigned to you. This story is taking you 3 days to finish. During those 3 days you have team members constantly pushing their story branches and merging them with the master branch, which leaves your local branch far behind the master branch. There might even be conflicts between your edits and someone else’s edits. One strategy to mitigate potential problems is to regularly rebase from the master branch. 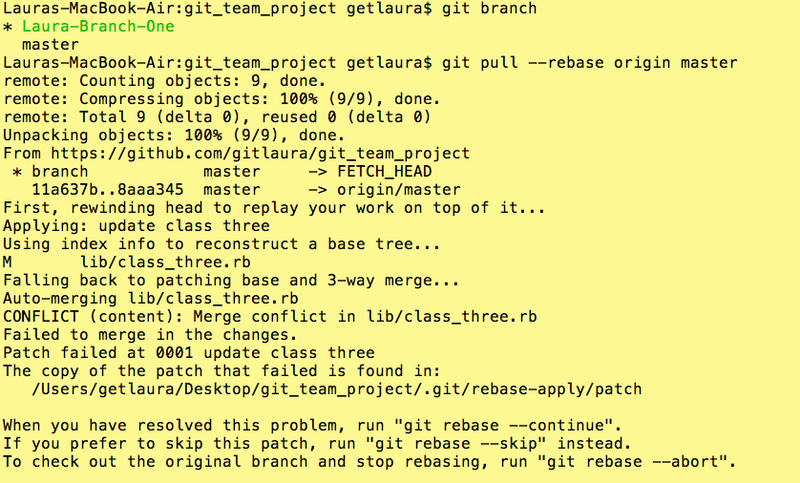 The important git command we’ll use in this case is $git pull –rebase origin master. This will fetch the master branch from your team repo and then rebase your branch with the master branch. If there are any merge conflicts, git will notify you so you can solve them step-by-step. Oops, I ran into a merge conflict! It looks like I need to check out the lib/class_three.rb file and choose which changes I would like to keep. I do this using vim. Delete everything that was added to the file and leave it with the edits you want to keep. Now you’ve completed your rebase. When you’re done you can keep editing your branch or push your branch up to the team repository with a clean history. This entry was posted in Developer Tools, git and tagged git merge, git rebase. Bookmark the permalink.